This is a simple, seasonal condiment that's smoky, spicy, and savory. I love putting apples and pumpkins together. Those just say 'Autumn' to me! Preheat oven to 350 degrees F. Roll the cubed pumpkin and diced apples in a splash of olive oil. Roast until pumpkin is caramelized, approximately 40 to 50 minutes. In a large flat-bottom pan, brown shallots and peppers in a splash of olive oil. Add the apples and pumpkin, 1 C water, 1/2 C vinegar and bring to a simmer. Pour in 2 T yuzu juice and more water if needed. Continue cooking until the pumpkin begins to lose its shape. Then stir in 2 t smoked paprika and season with freshly ground salt and pepper o taste. Spoon into sterilized jars and process in a water bath. 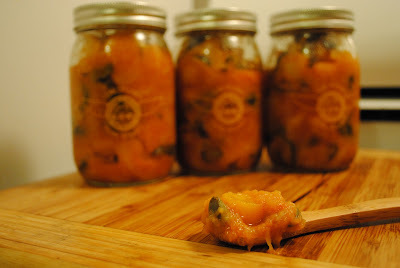 I love this pumpkin/apple combo for the salsa. Perfect for Fall. I can never wait to see which recipes you've come up with and chosen to share - this looks out of my spice comfort level, but love the combination of flavors and ingredients!